Some of us are quite giddy and literally jumping for joy about being so close, though it will work out that Cory is saving his energy. We have an early dinner to allow for some time to try to get some sleep in anticipation that we will start our push to the summit at midnight. This is definitely the steepest part of the hike and the most strenuous with lots of switchbacks…and may be one of the reasons why the midnight ascent is so popular. I have heard people comment that if they were able to look at the route in daylight, it would seem too daunting (not so, of course for us Coloradans). So every night during the ascent portion of the trek, we would be measured with a pulse ox machine to assess our oxygen levels and to see if there were any worrying trends. Funny enough I had done well, actually the highest in the group until this night – and I started feeling funny and I figured it was from lack of sleep the last few nights (maybe slept a total of 2-3 hours in the preceding 36 hours). Well unfortunately I was starting to develop a case of AMS though I really thought I was just tired. We started the hike after eating a large breakfast and it seemed like the hike would be like any other hike I have done. Looking around everyone seemed a bit sleepy (well except Robert and Cory) and I just kept saying that I was just really, really tired. Though I started to get worried when I realized that I just wanted to lay down and sleep and that could be life threatening since it was so cold out. So I figure I at least don’t have a cerebral edema since I still am having cognizant thoughts and that I just have to keep moving – luckily for me, there was Cory and he just kept pushing me up and up. 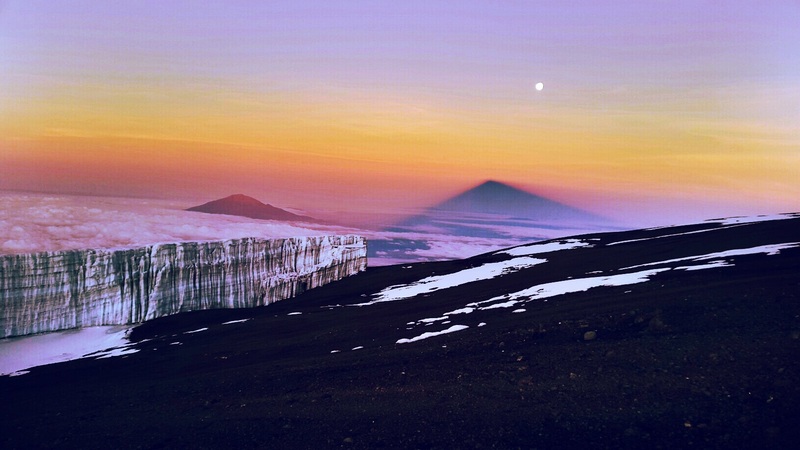 So this is why you start the last ascent at midnight…to see the sunrise and witness the full majesty that day break on the roof of Africa brings. 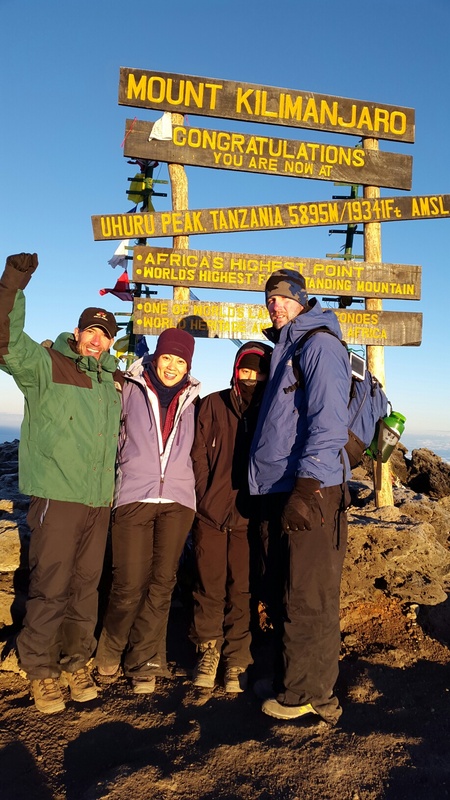 And that final push was oh so worth it….the Kilimanjaro glaciers were even more magical than we could have ever imagined. We get to Stella Point (approximately 18,000 ft) and think there is still an hour to go? But onward we go and continue the slow and cold march and it is an arduous hike to Uhuru Peak 19,341 ft (5,895 m) and we all make it! And I am amazed by the beauty but realize now that I am starting to feel really, really sick and I just want to get off the mountain. Kili is literally trying to kill me (as you can tell by the miserable expression on my face in the picture that proves we really did it!) and I start the ascent down and once again I throw up at Stella Point. And now I see that Robert is worried and that he thinks that I should be getting down as quickly as possible as well and we start booking it down the mountain. Luckily he is very sure footed because it is a very dusty and well traveled trail and we end up doing a lot of sliding but luckily never falling. I start laughing because I think to myself I finally get to start going faster. The hike that took 6.5 hours on the way up takes us a couple of hours on the way down and we end up again at Barafu Camp and I start to feel a bit better and lay down to sleep. I awake from a couple hour nap with an extreme thirst and realize that I haven’t had anything to drink since the first part of the ascent but feel extremely nauseous. Side note: I can get some pretty bad migraines and unfortunately suffer from nausea quite frequently with them. Though it has been such a long time that I have been dealing with that issue, that I know when I can or cannot have anything in my body. Today I have to make a pact with my body – that it needs water but that is all it will keep down. I start with little sips every 10 minutes….so far, so good…looks like the pact is working and I manage to keep a few ounces down. We are offered lunch and I come along and continue to have a little bit of water every few minutes and am starting to feel so much better. Our head guide is concerned and wants me to eat – I explain to him that I can’t and won’t be able to keep anything down. We go back and forth and he crosses his arms and settles into his chair with the expression on his face stating “you don’t eat, we don’t go”. I look at the food and think there is no way I can keep anything down but reach for a piece of cucumber – it has a high water content and I love cake water and hope for the best and take a small bite. Five seconds later, I push past Cory and run out of the dining tent – looking quickly for an area where someone hopefully won’t step and proceed to violently throw up. After emptying my stomach completely, I realize that our entire camp had stopped what they were doing and look at around at all these porters with the most concerned looks on their faces all staring at me. 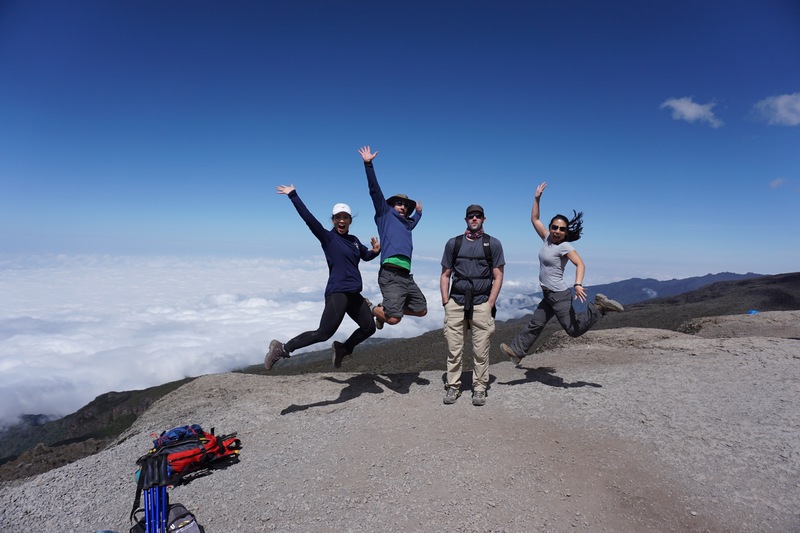 It’s cool I tell them in Swahili, brush my teeth and start the trek down to Mweka Camp at 10,146 ft (3,092 m). We ended up hiking over 13 miles in all this day and luckily all signs of AMS begin to abate.